This is the first issue of the rebooted Working Smarter Newsletter, aka version 2.0. My goal is to provide you with useful tips, hints, and techniques you can use to work smarter, along with links to tips, hints, and techniques of others you might find beneficial. I heard this today on one of my favorite podcasts—MacGeekGab—and it reminded me that if I had forgotten about it, so (perhaps) have you. So, here's the tip: Hold down the Option key before you click the Wi-Fi menu to see additional useful information regarding your connection and available networks. The most important bit of information (at least to me) is the MCS Index. While not a precise measure of network throughput, I've found that the higher the number, the better/faster the connection in that spot, at least for downloading or streaming media. Before you write to tell me that neither the MCS index nor the Speedtest app are particularly accurate, save yourself the trouble—I know. The thing is, this tip gives you a handy, free way to get an idea of your current connection quality. Next up: An article I read on Fortune (dot) com last year about multitasking (and why it may not be good for you). I blogged about it last year, and it's still a winner. And, I still couldn't agree more. "Start by blocking out a period of time to focus. Eliminate as many distractions as possible: Put away your phone, turn off extra computer screens, shut down your email if you have to. Don’t try to mono-task by willpower alone; it’s too hard to fight the thirst for new information. Instead, prevent the urge by removing temptation. If you find yourself unable to concentrate, try taking a short break and move around. Increasing blood flow to your brain can help restore focus." One of the cornerstones of Working Smarter for Mac Users is that you get more work done when you focus on one task at a time. I knew this instinctively, but only after years of trial and error, which is why I found the science that seems to prove it so fascinating. I like it a lot, calling it, "Netflix for Mac Apps" in a recent Rants & Raves column for the Mac Observer. And here's the Setapp detail screen for BeFocused, (an app I discuss enthusiastically in the new Working Smarter for Mac Users online course, by the way). Read my column at the Mac Observer. Visit Setapp.com for additional information. I read a lot of stuff about being more productive and improving my concentration, and James Clear is one of my favorite gurus writing on the topic. I love his stuff and find most of what he says inspiring. He doesn't send stuff often, but when he does, it's almost always good stuff. Read How to Focus and Concentrate Better (Lessons from a Lion Tamer). Sign up for his newsletter (if you like his writing half as much as I do). I'm going to begin a Grand Opening promotion for the new 10-hour Working Smarter for Mac Users course this week, but I wanted you (my loyal newsletter readers and friends) to have an even better deal. The retail price of the course is $499; the Grand Opening deal I'll be promoting next week will be 50% off ($249). Enroll by Monday, March 5 using coupon code reader75 at checkout to save 75% and pay just $124.75! Enroll now and save 75%! That's all, at least for now, but I'll be back. I'm going to try to send you something useful at least once a week, but I've learned my lesson, so that's not a promise. Have a great week. I'll talk to you soon. P. S. Are you on my Insiders email list? If not, you're missing out. You're gonna miss out on great tips, hints, techniques, reviews, recommendations and more. I never clog your mailbox with garbage; if I send you an email, I guarantee it'll be good and handcrafted by me, just for you. There's no cost or obligation... the only reason I can think of not to try it would be... I can't even think of one. You're gonna love being an Insider — I guarantee it. I just sent the email below to literally everyone I know to bring them up to speed on what I've been up to, since I haven't posted here or sent out a newsletter in months. Sign me up for Dr. Mac's 100% FREE email list! I know it's been a while since last we spoke. I'm sorry. It's just that I've been busier than a one-armed wallpaper hanger with my latest project (more on that shortly) and haven't had time for much that wasn't mission critical. And, I'm sad to admit that personal correspondence and newsletters weren't mission critical. If you're none of the above and have no idea who I am or why you got an email from me, I apologize for the intrusion. Please click the unsubscribe link at the bottom of this message and you won't hear from me again. Or, if you are one of the above but still don't ever want to hear from me again, please click the unsubscribe link. Moving right along, the thing that's kept me so busy for so many months is a brand new 10-hour course I wrote, produced, directed, and edited, called (of course) Working Smarter for Mac Users, based on my popular 2017 eBook of the same name. I couldn't be happier. It came out great and I know it is going to help many Mac users learn how to do more work in less time so they have more time for things they love. Enrollment starts tomorrow, so watch for the grand-opening announcement and special "friend-of-bob" pricing in your inbox (as soon as I confirm that everything works as well with real students as it did with my beta testers). Have a fabulous week; I'll be in touch soon. P. S. This also marks the return of my newsletter, with all the tips, techniques, and advice on becoming more productive you've come to know and love. I'll get the first one out as soon as I can, so please stay tuned. After 16+ Years of Nearly Continuous Development, My New Online Course — Working Smarter for Mac Users: Improve Your Efficiency — is Now Open for Enrollment! After more than 16 years of nearly continuous development, I'm proud to announce that my first video training course — Working Smarter for Mac Users: Improve Your Efficiency — is now open for enrollment. It would be an understatement to say I'm proud of Working Smarter for Mac Users: Improve Your Efficiency. I’m more than proud — I’m ecstatic. And, I'm tickled that more than 150 Mac users have already enrolled! This has been a dream of mine for over a decade and I'm just getting started! Working Smarter for Mac Users: Improve Your Efficiency is merely the first in a series of video training courses; I expect to have three or four more available next year. The NBT ("Next Big Thing") Recording Company never came to be, and all that remains of that proposal today is the cover page and a low-resolution QuickTime demo. I'd love to share that demo with you, but I was consumed with such incredible hubris in 2001 that I used Survivor's, "Eye of the Tiger" as background music. What can I say? I was dead certain that Bob-O-Vision was going to be “the next big thing,” and our millions of dollars of VC funding would let me license any music I cared to. It took another 16 years for me to get it right, but I think I did. 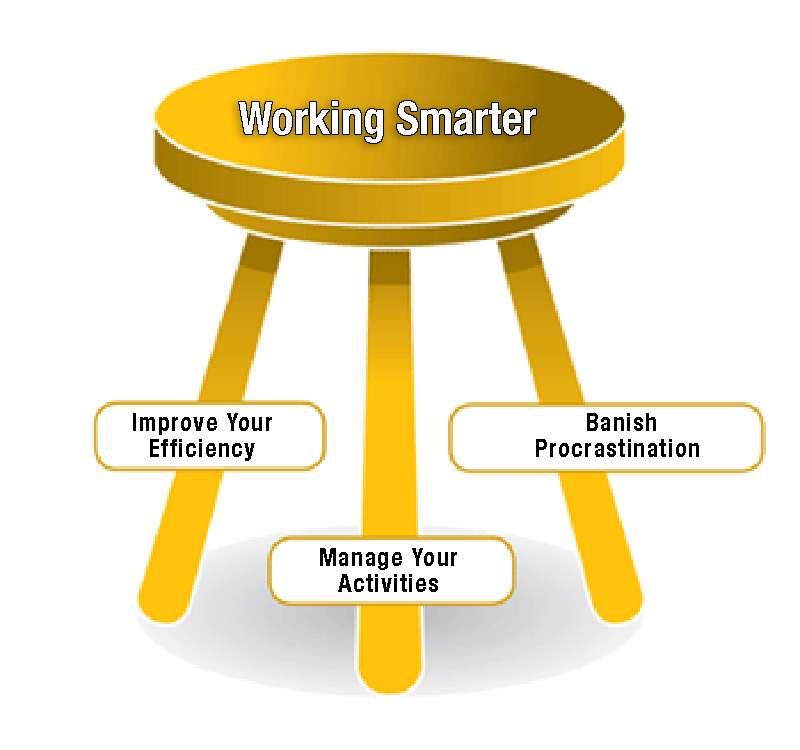 Check out Working Smarter for Mac Users: Improve Your Efficiency and see for yourself. Join my mailing list (it's 100% free)! I hope you enjoy this short film by yours truly (Bob “Dr. Mac” LeVitus)... 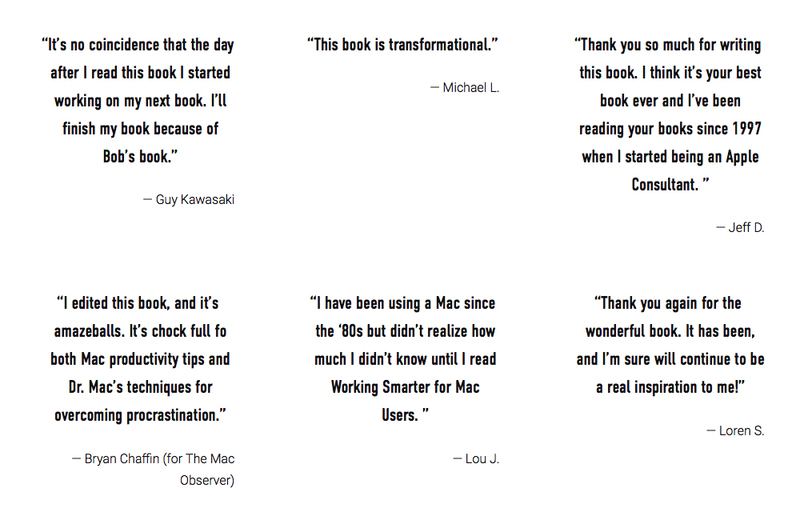 It explains why you SHOULD NOT BUY the softcover version of my latest book, Working Smarter for Mac Users, and why the eBook version is so much better. My editor Bryan Chaffin says one of the best (and most unique) things about Working Smarter for Mac Users is that I don't try to convince you there's only one way to do things, or that my way is the best or only way. Rather, one of the hallmarks of my eBook is that I offer you tips, hints, and techniques that have worked for me, as well as tips, hints, and techniques that may not have worked for me but may very well work for you. One of the things I hated about the myriad productivity and time management books I've read (not to mention the workshops, seminars, and courses I've attended) is that they're so rigid about the right way to do things. In other words, they make you believe their way is the one and only right way. 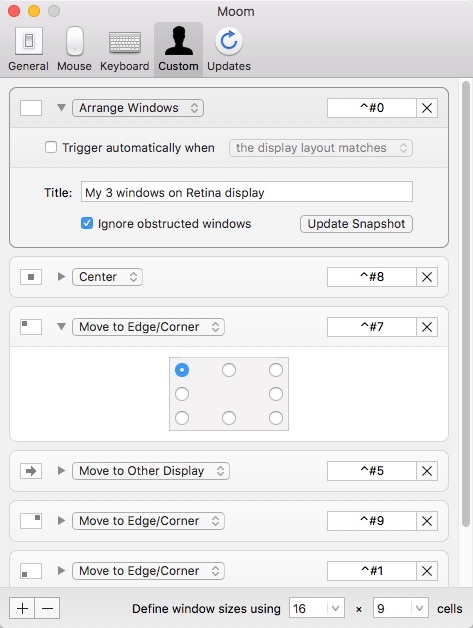 Working Smarter for Mac Users, on the other hand, is chock full of tips like the one below, a tip Bryan felt was so important he urged me to typeset it in both bold and italic: "That’s what works for me. If you prefer all-digital, all-analog, or any combination of the two, that’s excellent. The important part is that you make a plan, and then use it." In this case I was talking about my SuperPlan Daily Productivity Planning Worksheet, which you can download for free, so please do. I must say it's one of the most powerful tools I know of for keeping me on track and avoiding procrastination. Now, the reason I mentioned it here is that I posted a note in social media recommending an article by Brian Tracy about setting priorities using the ABCDE method: . 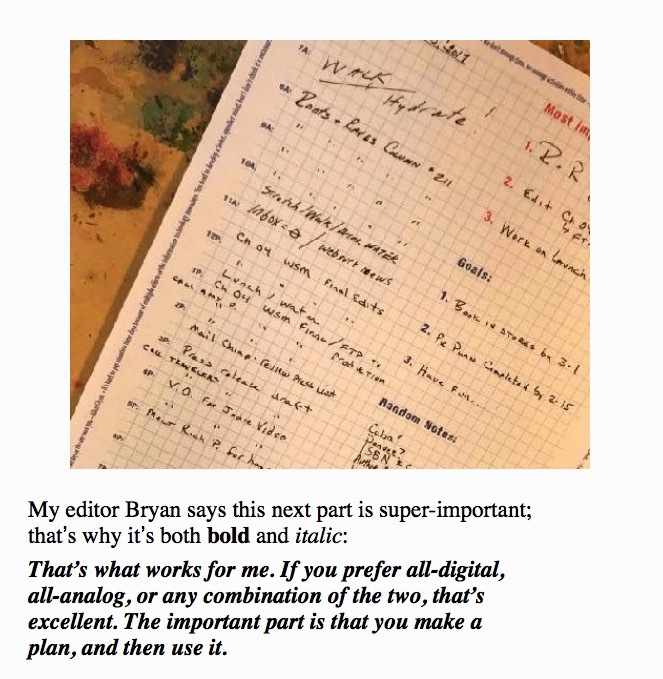 Brian Tracy's method is similar to my SuperPlan worksheet but different. 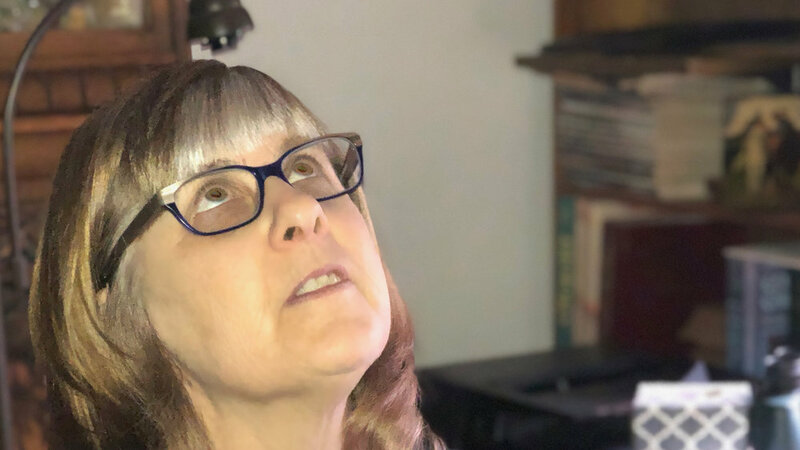 Where I define up to three "Most Important Tasks" each day and make them my priority, Tracy's method asks you rate all of your tasks with an ABCD or E and then use those ratings to sort them accordingly. That being said, I definitely understand that the ABCDE Method might be valuable to others. So, I recommended this article everywhere I could think of. The best part is reflected in this series of comments on my Facebook post. This is exactly what (I think) my editor Bryan is talking about... And precisely the kind of thinking I want Working Smarter for Mac Users to foster. Here is another skill I recommended in the first chapter of Dr. Macintosh (1989) and still recommend to this day. That skill is reducing your dependence on the mouse. Many of the things you do with your mouse can be done faster and easier with a keyboard shortcut. Memorize the shortcuts for Cut, Copy, Paste, and Select All to improve your productivity big-time. Memorize the first three commands in the View menu and use them often. In any case, switching views quickly make it easier to work in the Finder. For example, if I am browsing a folder with a lot of pictures in List view (background window below), I just press Command+1 to switch to Icon view so I can see thumbnails of the images (foreground window below). These are the symbols you'll see next to keyboard shortcuts in your menus. So, look for these shortcut symbols in menus, and memorize the ones you use most. 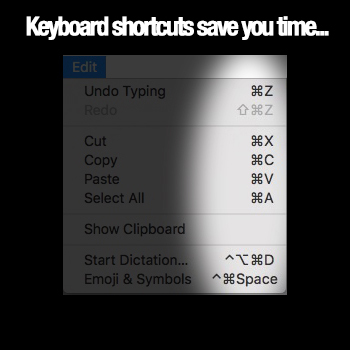 Trust me, keyboard shortcuts are faster every time; you’ll save many minutes every day not reaching for the mouse/ trackpad or moving it up to a menu item, which slows you down more than you think. I created a two-page PDF you can use to memorize some of the more useful shortcuts; you can download it here. Now, tape both pages to your monitor, and then don’t remove them until your fingers automatically perform these shortcuts every time and you never think about reaching for the mouse. I know it might seem weird that I’m telling you to print it, but that way you won’t need a mouse to find it. Plus, if you only keep it as a file on your hard drive you’ll surely forget about it. Copywork is not the same as copywriting (or plagiarism, for that matter)... But it may help you not write like an a-hole. Hello blog-readers! This entry starts with a short tip on drive failure rates that could be useful the next time you buy a hard drive. That's followed by an excerpt from my new eBook, Working Smarter for Mac Users, an excerpt virtually guaranteed to make you more productive. Backblaze is a cool company that releases information like this regularly. I don't know how many people use Backblaze for their offsite backups, but it's probably a lot (and it includes me). What I do know is that they had 73,653 hard drives spinning in 2016, and I know the brand, capacity, and hours in service for each of those drives. I also know the most important statistic of all—the failure rate for every model. Moving right along, here's a little excerpt from Working Smarter for Mac Users with a tip that will almost certainly make you more productive than you are at the moment. It was the summer of ’84, and there I was: A 29-year-old writer who didn’t know how to type. But I knew I was going to order a Mac when the new model (Mac Plus) came out, and I didn’t want to embarrass myself by acquiring this magnificent machine and then hunting-and-pecking it to death. I borrowed my wife’s old Smith Corona portable electric typewriter (like the one shown here) and bought a typing instruction book at my local bookstore. Remember, there was no Internet back then, ergo, no Amazon.com or other modern niceties. The book was boring and consisted of nothing but drills and timed tests, but I stuck with it for a few weeks, a few minutes a day, and before long I was a touch typist. And not long after that I clocked myself at around 65 words a minute, which was good enough for me. 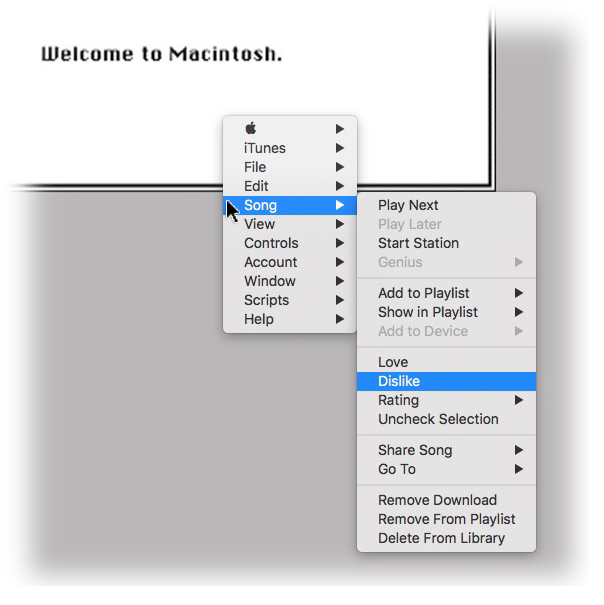 I didn’t think much about it until I started working on my first book, Dr. Macintosh: Tips, Techniques, and Advice for Mastering your Mac that it bubbled back into my consciousness. If you’re not typing at least 40 words per minute, you’re wasting time. This was good advice in 1989... and it's still good advice today! I wrote those words in 1989, but they’re as true today as they were back then. I hadn’t taken a typing test since that time, but because I’d never ask you to do anything I wouldn’t do, gentle reader… I just took an online typing test and it said I type 54 words per minute, which isn’t bad considering I haven’t practiced typing (other than my everyday writing) for at least 25 years. Now it’s your turn: Point your browser at www.typingtest.com and take the test right on the front page. It’s painless and will take you 5 minutes or less (I’m impatient, so I took the 1-minute version). Here’s some bad news: Those of you who don’t type at least 40 words per minute need to learn how to type faster. It’s among the easiest ways you can improve your productivity, so for heaven’s sake—just do it! So much of what you do on your Mac requires keyboard input; typing faster will speed up almost everything you do. And it’s so much easier to improve your keyboarding skills today than when I did it years ago on that old Smith Corona. Consider yourselves lucky: You don’t have to go to a bookstore, buy a book (or anything else), or even leave your home or office. Click "Train for Free" to learn to type faster. For free. Go back to www.typingtest.com, but instead of taking the typing test, click the big green Train for Free button. You’ll probably get the best results if you choose the 21 free lessons, which are sure to increase your typing speed a lot. The site promises to double your speed, but I wonder if that’s true; please do me a favor and drop me a note if you try it—I’d love to know if it doubled your speed. If you don't like lessons, try a typing game like this one. Or, if you’re not prepared to commit to 21 lessons—even though you should if you can’t type at least 40 w.p.m.—try the Typing Games instead. I like the Typing Attack game, which uses a Space Invaders metaphor with words dropping from the sky for you to shoot by typing the word before it crashes into the ground or your letter-firing cannon. The point I’m making is that if you aren’t typing at least 40–50 words per minute, you could easily speed up almost everything you do by improving your keyboard skills. Imagine finishing everything you do 10, 20, even 30% faster, which is entirely possible if you just improve your typing skills. If you feel you’re already a pretty good typist (say 50 w.p.m. or more), consider this: If you spend a little time each day for a week working on drills and/or games at www.typingtest.com, you could be typing 80 or more words per minute! Think of all the time you’ll save. I'm so happy to have finished Working Smarter for Mac Users. All of the chapters are in production and the final iBook, Kindle, Nook, PDF, and print-to-order versions should be available by the end of February assuming no major hiccups. Now, I've got some very good news for you: You don't have to buy my book. I know it sounds crazy but I want everyone to see it so I'm going to give away all or most of it right here in the coming months. Just keep coming back (or sign up for my free newsletter) and you'll see all (or at least most of) the book's contents right here. It may take a year or more but I'm not going to hold back—all the good parts will appear here for free. Eventually. Of course, if you can't stand the suspense and don't want to wait you can pre-order your copy now so you'll be among the first on your block to own it. In the meantime, I've posted the book's frontal matter—the Table of Contents, Introduction, and Prelude— for your reading enjoyment and edification, so please enjoy them at your convenience! What you probably don’t know is that you can also add any folder or file to your Toolbar by holding down the Command key when you drag the item onto the Toolbar. In the figure above, I’ve added the Dropbox and Work folders to my Toolbar, making it easy for me to drag files or folders onto them or open them with a click. The Command key is also the key to other useful Toolbar tricks. For one, you can rearrange the items on the toolbar while the Customize Toolbar overlay is open, but it’s often faster to press the Command key and rearrange your Toolbar icons without bothering with the Customize Toolbar overlay. Or, hover the pointer over any item in the Toolbar for a few seconds and its description appears as a tool tip (Perform tasks with the selected items in the figure below). One last thing: If you try to drag a file or folder to the Toolbar and it won’t stick, chances are you’re trying to drag an alias. You can’t do that. Instead, find the original file by clicking on the alias and choosing File-->Show Original or Command + R, and then dragging the original file onto the Toolbar. P. P. S. Comments, feedback, requests, and such are always appreciated... Leave them in the comments section here or email me at: bob@workingsmarterformacusers.com. I'm thrilled to announce that I've finished the writing portion of Working Smarter for Mac Users. All I've got left is a final edit and production. So, if all goes well it, should be available in the iBook Store, Amazon.com (Kindle Store), and elsewhere by the end of February. From now until the day it ships, you can pre-order your copy and save up to $20. Click here to view the Table of Contents, sample chapters, and additional information (or to order your copy of Working Smarter for Mac Users). It's traditional that I write at least two gift guide columns toward the end of each year and this year was no exception. In fact, this year I recommended more cool products in my three gift columns than ever before. Rather than sending you all over the Internet to read them, I've summarized or pasted all of the salient details (and more—including pictures!) below. One of the best ways to insure great-looking pictures is to keep your camera still. So, my first suggestion this year is Kenu Stance ($24.95), an ingenious tiny tripod that connects to your iPhone’s Lightning port using MicroMount, a patent–pending attachment made of a durable, resilient resin known as Grilamid. That doohickey connects to a ball-and-socket mechanism, allowing precise positioning of your iPhone in both portrait or landscape modes. Despite being smaller than a pack of gum and weighing about as much, the rest of the device is fabricated of heavy-duty zinc alloy, making it solid as a rock. Finally, one of its legs doubles as a bottle opener. Bottom line: It’s earned a permanent spot on my keychain so I’m never without it. I bought my first (and so far, my only) pair of Grado headphones more than 20 years ago. I never expected them to last this long, and I never expected them to still be among my favorite headphones of all time, but they are. Handmade in Brooklyn, N. Y. since 1953, Grado still makes some of the most amazing sounding headphones you’re likely to encounter. Now for the good news: While they no longer make my beloved SR60 model, its successor (SR60e), which sounds as good or better, still sells for under $100.00. As much as I love the Blue Yeti USB microphone ($122.09) I use for podcasts, voiceovers, and GarageBand and Logic Pro recordings, it’s a little too bulky for travel. So, for years I’ve been on the lookout for a portable mic that sounded as good as the Yeti. I found it in the new Blue Raspberry mic ($199.00). With its new, patent-pending Internal Acoustic Diffuser (IAD) to minimize environmental sounds on your recording; an integrated stand with a connection insulator and shock absorbing feet; and both USB and Lightning cables in the box, it’s the best sounding microphone I’ve ever used on the road. Next, if your geek’s iDevice is running out of space, SanDisk has an elegant solution—the iXpand Flash Drive. These little gems look like ordinary USB flash drives, but have a flexible Lightning connector at the end opposite the USB 3 connector. The free iXpand mobile app lets you back up your iDevice’s Camera Roll automatically, transfer videos and photos to and from your iDevice, and watch movies in popular video formats including WMV, AVI, MKV, MP4, and MOV. Prices start at $49.99 for 16GB to $129.99 for 128GB. I’ve seen many iPhone cases that purport to replace your wallet, but most of them don’t hold enough stuff. The Folio Wallet Case for iPhone 7 and 7 Plus is the exception, with separate pockets for 4 credit cards plus a full-sized place for cash. It provides more than adequate protection; includes a screen protector and wrist strap; and folds into a stand for viewing movies. With all that going for it, the lifetime warranty and ultra-low price of $14.99 are merely the icing on the cake. If you know a geek who is tethered to his or her iDevice by a headphone cable, the Reach Bluetooth Audio Receiver ($24.99) will let them use their favorite wired headphones without the wires. Just pair the Reach with your iDevice, and then plug your wired headphones or earbuds into the Reach. It’s tiny—about the size of a book of matches—yet it offers a full array of controls including volume up and down, track control, an answer/hang up/play/pause button, and a built-in microphone so you can use the telephone hands-free. For what it's worth, though it's not designed for non-bluetooth speakers, I tried it and it works pretty well for that as well. If your geek likes his or her wired headphones, this little doohickey will makes 'em wireless for under $25. I’ve loved using Olloclip lenses with my iPhones for many years, so I’m pleased to report that their latest and greatest—the Core Lens Set for iPhone 7/7 Plus—may be the best set yet. For just $99.99 it includes not one, not two, but three lenses: a fisheye, a super-wide angle, and a 15X Macro—all with new and improved premium multi-element optics. There’s also a new Connect interchangeable lens system, so it’s easier to use other lenses (not included) like a 2X telephoto. My favorite new feature, however, is a new hinged lens base that not only keeps the lens flush with the camera for improved optical performance, but also lets you use lenses with (most) screen protectors. YEA! I’m a little ashamed to admit I want one, but I think I’d like a Useless Machine Kit (No Soldering) from Fry’s Electronics ($34.99). Once assembled, this little box has a single switch and a motorized arm that pops out, flips the switch, and then goes back inside the box. It's simple, totally useless, and (from what I hear), never gets old. As the name implies, there’s no soldering necessary—all you need is a screwdriver for hours upon hours of useless fun. I've released three books in the past month or two — iPhone For Dummies 10th Edition and iPad For Dummies 9th Edition (both with co-author Ed Baig), and macOS Sierra For Dummies, which is all mine. They're all pretty good books if I do say so myself. Heaven knows they've been updated enough times to get all the bugs out. They make a thoughtful gift for mom, dad, or anyone who is just getting started with their Mac, iPhone, or iPad. And, with all three priced around $25 at Amazon.com, they won't break the bank. Last, but certainly not least, with the holiday season in full swing, my top gift suggestion for any music-lovers in your life is a subscription to Apple Music. Apple Music, if you haven't heard, is Apple's subscription music service with over 30 million songs for subscribers to either stream or download to their Apple devices. Not that I care, but I'd be remiss if I didn't at least mention that it works with many non-Apple devices including Windows PCs and Android phones and tablets. First and foremost: If I can think of a song title (or part of a song title or even the artist’s name sometimes), I can usually find the song in a few seconds and be listening to it a few seconds later. I also love being able to search for music by genre and year—such as, “rock hits from 1973,” “jazz from the 1950s,” or “space-age bachelor pad music” to name a few I’ve used lately. I also like that searches often reveal curated playlists you can save for future streaming or download for offline listening. Which brings me to the second thing I love about Apple Music: Siri. I mean, sure it’s cool to search 30 million songs by genre, year, or artist, but it’s cooler to say, “Hey Siri! Play rock hits from 1973,” and make it so. I ask Siri to play music for me almost every day and I love this feature more every time I use it. By the way, on iOS devices (and macOS 10.12 Sierra), you don’t have to subscribe to Apple Music to ask Siri to play music from your iTunes library. If you’re not asking Siri to play music for you already, why not give it a try? Moving right along, the third thing I love about Apple Music is the price—Student Memberships are $4.99 per month and Individual Memberships are $9.99 per month. Those are good deals but the best deal is a Family Membership, which provides the full Apple Music experience for up to six people for a mere $14.99 a month. And the fourth thing I love about Apple Music… is sharing albums and playlists with other subscribers, especially my wife, and kids. Now, when I come across a song, album, or playlist one of them might enjoy, I send them a link, which they can listen to immediately and add to their music libraries if they care to. If you prefer not to give a monthly subscriptions as a gift, why not consider an iTunes gift card, which start at just $10 and can be used for Apple Music or iTunes, iBooks, or apps for Macs or iOS devices. One last thing: The Amazon.com links above are all "sponsored," so they generate small (micro) payments. Please use them if you don't mind. You pay the same price, and by using them you help offset the costs of running the site, newsletter, and blog. Thanks!